Quilt Canada Solids Mini-Quilt Challenge! 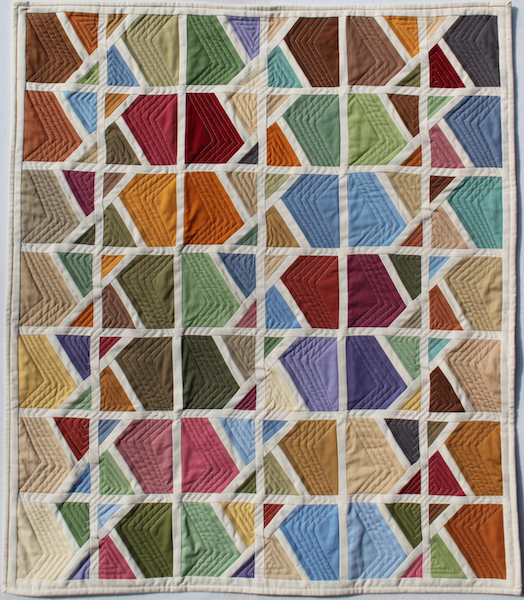 The Toronto Modern Quilt Guild issued a challenge to its members, create a 14 inch square solid mini-quilt from a select colour palette. No embellishments, no applique, and the quilt had to be bound with a faced binding. The quilts would be put on display during Quilt Canada and the pubic would vote for their favorite. Seven colours were selected for the palette and only 3 of these or less could be used. The colours are from the top: Storm, School Bus, Peridot, Ash, Berry, Coal, and Pomegranate. I chose to use Pomegranate, Coal, and Ash. I created this piece improvisationally using a log cabin design. I enjoyed the process and especially loved hearing comments from people viewing the quilts during Quilt Canada. 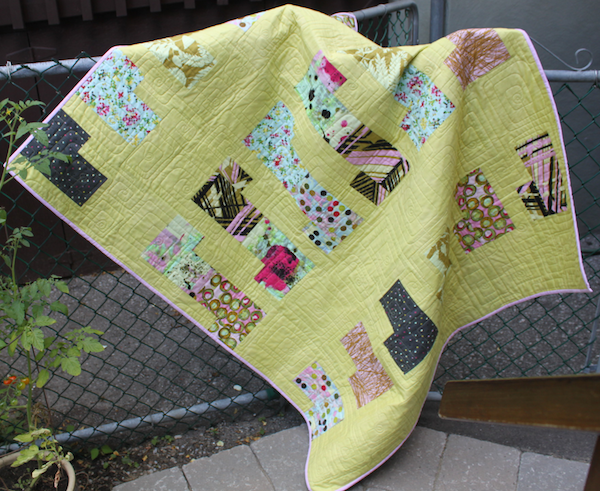 There were three winners of the Quilt Canada Solids Mini-Quilt Challenge. First prize went to Rebecca Burnett, second prize went to Doris Lovadina-Lee (me!!) and third prize to Lynda Hutchinson. 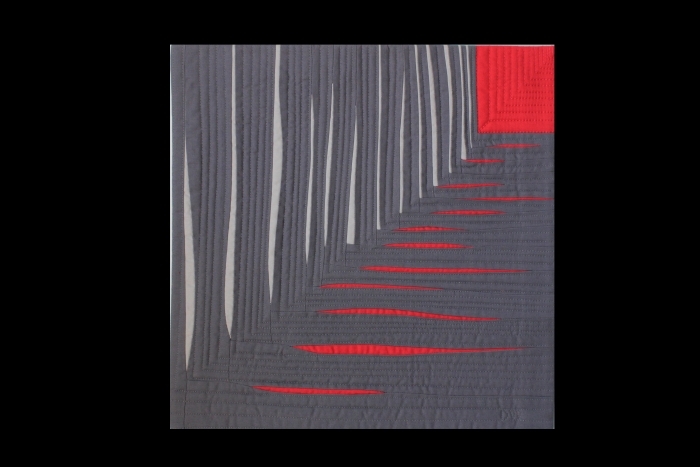 Many more great photos are on the Toronto Modern Quilt Guild Facebook page and blog. 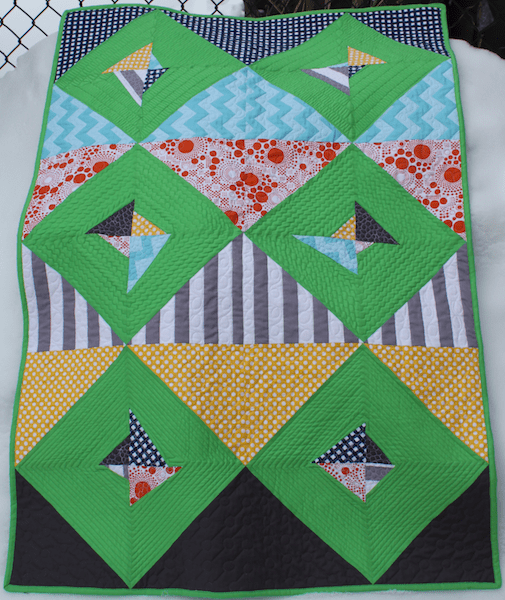 Head on over to see the other entries in the Solids Mini-Quilt challenge and other quilts our quild had on display. I was the facilitator for the May meeting of the Toronto Modern Quilt Guild. One of our new members, Emily, was interested in how to piece curved seams. 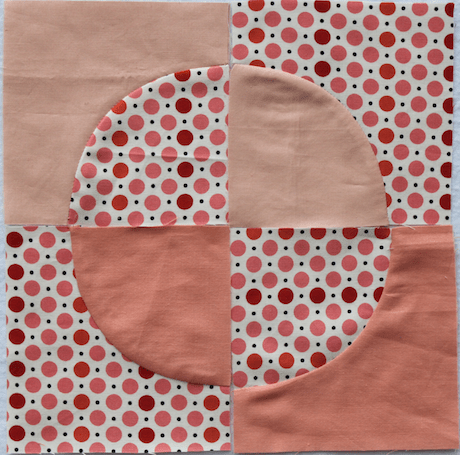 So, I demonstrated curved piecing – full circles, quarter circles and my favourite – wonky circles. I used Petal Pinwheels fabric from Michael Miller. 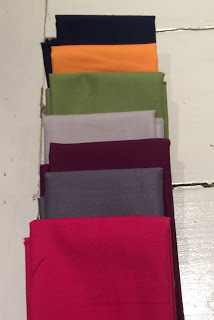 These are the six fabrics that Michael Miller donated to the 4th annual MQG member’s fabric challenge. I added the Kona solid in green from my stash. Cut your pieces out exactly! When sewing curves, you will need to stitch slowly, sew a few stitches, stop, pivot to readjust the curve, continue sewing a few stitches, stop, and pivot and so on. You are only looking at about 1/2 an inch in front of the pressure foot and in smaller circles, this might only be 1/4 inch or so in front of the foot. Sewing curved seams is not like sewing straight seams where you can quickly sew through piles of blocks in an assembly line. 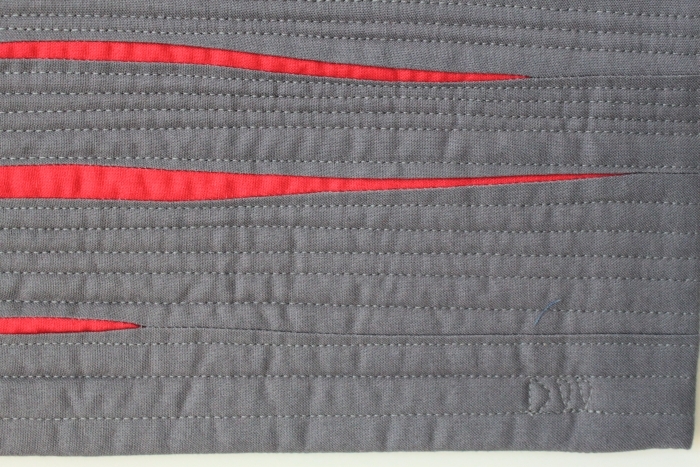 Stitching curves requires focus and time. 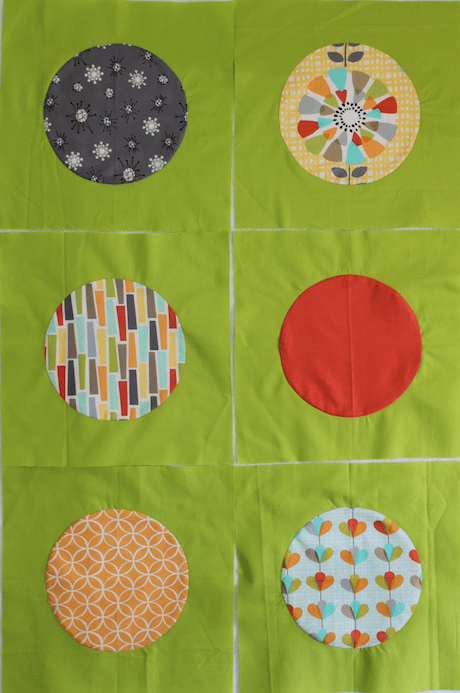 The circles below were the pieces cut out of the background or square fabric. 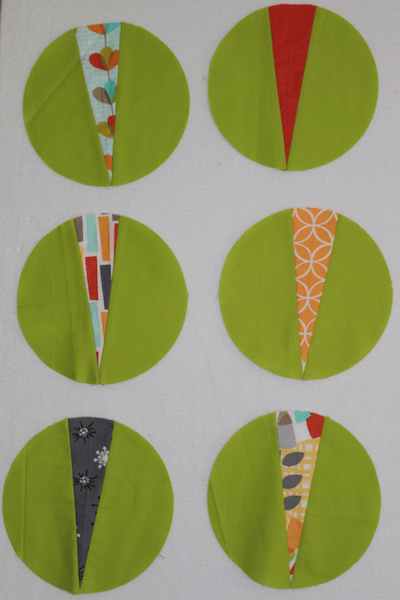 I took these circles, split them and inserted a wedge of the Petal Pinwheels fabric. I then trimmed the block into a circle. I had wanted to make the insert off centre – a little wonky but I didn’t make the cut enough off the centre line. Nevertheless, I am happy with the way they look and will use them in another project. As for the Modern quilt challenge blocks, I need to think about them a little longer before I decide what I want to do. Should I combine the circles with the wedges? The deadline and my fabric stash will factor into the process!